The advantage of this natural building system really comes into focus as we look at the dynamic of thermal mass plus thermal insulation, as compared to rating the R-value alone. Insulation (measured in construction in terms of R-values) slows the transfer of heat across a surface. The light clay/fibre wall system traps air in many tiny pockets to provide insulation. It also improves energy efficiency by adding thermal mass, which absorbs heat (both from the sun and an internal heat source) and reradiates it back at night or when temperatures are lower. The advantage of adding mass to insulation is compounded when we take into account the comfort of living in the home, where heat is more evenly distributed – radiating from the walls and the floor if an earthen floor is installed. And in the heat of summer, air conditioning needs are significantly lower, as the intense daytime heat is absorbed by the mass of the walls and allowed to radiate out during the cool nighttime hours. 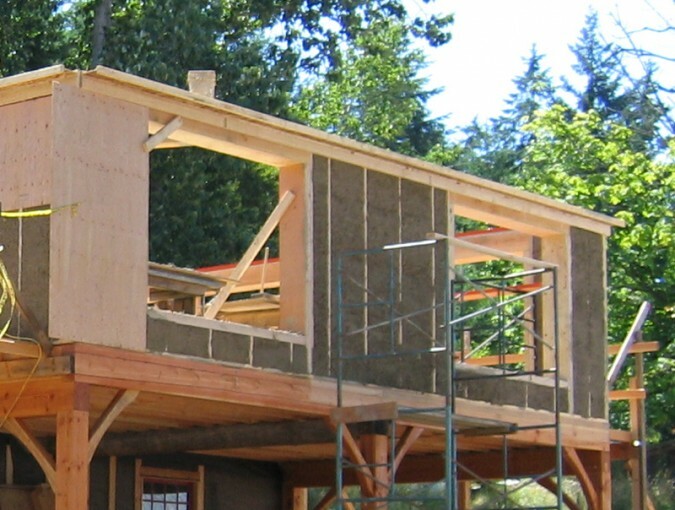 The light clay/fibre walls integrate seamlessly with a timber framed structure, as shown on the EcoNest homes web site. Alternately, the building shown in the picture is designed as load bearing, where the clay/fibre walls will support the weight of the roof.